​My name is Opeyemi Adeyemi. 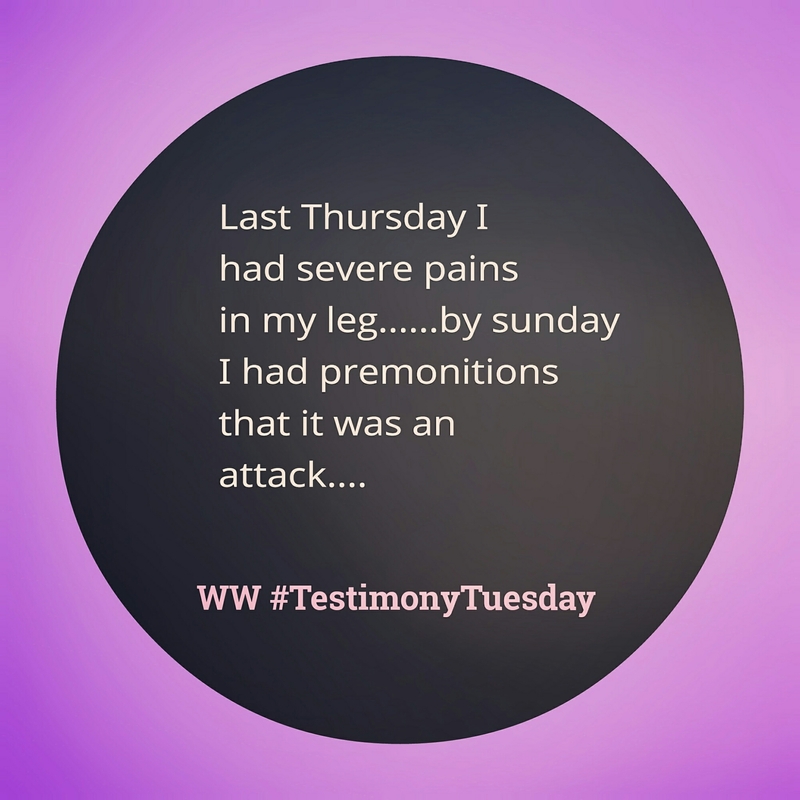 Last week Thursday evening, I noticed a pain on my left lap at the backside. I didnt do anything about it. All through that night, I couldn’t sleep because the pains doubled and the whole left leg was affected, though not swollen. I broke bread, anointed it and called Fikayo and Temmysan who joined me in prayers. I started limping and took panadol. By Sunday morning, my walking became normal but I had premonitions that its an attack bcos I had been praying and believing God for a breakthrough. I was fine till Monday evening when pains started again and I could hardly walk. I had a dream on waking up tuesday morning that I was at the reception of a party and my bed was in d middle of d event, I lied down in pains and as I tried stretching my leg, I turned over the seat behind me, so I apologized. A lady volunteered to help me massage it but as she was about to do that, another lady came into the hall. On sighting her people started whispering that she is diabolical. This lady moved towards me and forcefully grabbed the balm from d person who wanted to help me. Then she brought out her own balm and said that she came to rub that on me. By that tine, I was already up on my feet and I shouted that the Holy Ghost fire should consume her and she started shaking. By the time she wanted to apply her balm on me, I commanded her hands to wither and the balm fell from her hand and got broken, she then picked it up still shaking bcos I was still praying. Then I woke up. I could not walk again. The pains was severe and I was taken to d hospital. Standing, sitting and lying down was not comfortable for me due to d pains I was going through. A nurse asked if I needed a wheel chair, but I refused and said NO!. My mum had to hold me in order to support my movement. I saw d doctor who said I should go for ex-ray. The ex-ray result showed that everything was normal with me, so they could diagnosed what was wrong with me. I was given some drugs and went home. When I applied the balm on my leg, the pains increase x 4. I groaned in pains for days. I would anoint d leg and break bread(communion) and use my drugs. Fikky and Temmysan, my parents & siblings kept interceding on my behalf. This morning, i woke up walking well, d pains were completely gone. Then I went back to bed and had a dream; at first I saw myself at a viewing centre (Winners Chapel), later I entered a place and noticed that it was a very big court. I was the accused and was placed on a very high platform looking at d judge down where he sat. The judge asked “guilty or not guilty”? Everyone responded that I was guilty. Then a cage opened in which I was meant to fall inside. But afterwards I shouted, ” I am not guilty your honour, God is my witness” because I had no lawyer to defend me. As soon as I said. “Not guilty”, the cage closed. The judge asked again “guilty or not guilty?, some said guilty but majority said not guilty. “Our soul has escaped as a bird from the snare of the fowlers; The snare is broken, and we have escaped”.